Potentially Unwanted Applications (PUAs) continue to visually social engineer users into installing virtually useless applications. They monetize each and every install by relying on ‘bundling’ which often comes in the form of a privacy-violating toolbar or third-party application. 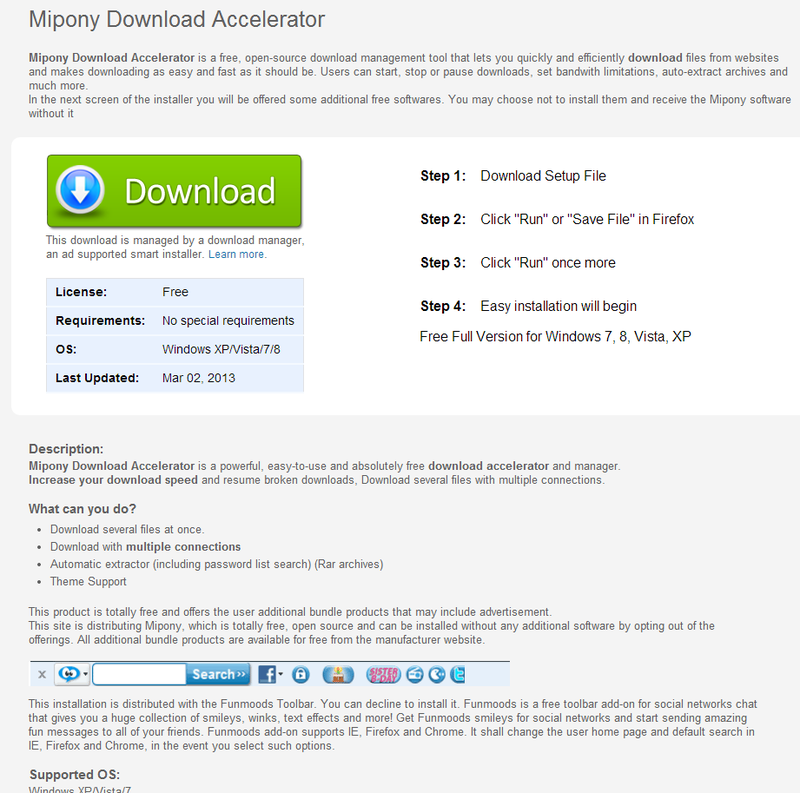 We recently intercepted a rogue ad that entices users into downloading the Mipony Download Accelerator that is bundled with the privacy-invading FunMoods toolbar PUA, an unnecessary bargain with the integrity and confidentiality of your PC. Detection rate for the PUA: MD5: 023e625cbb1b30565d46f7533ddc03db – detected by 6 out of 47 antivirus scanners as W32/InstallCore.R4.gen!Eldorado; Install Core Click run software. Despite the fact that most modern day PUAs include uninstall instructions, our advice is to not install them in the first place, instead, seek a legitimate — often free but this time fully featured and working — alternative to their pseudo-unique value propositions.